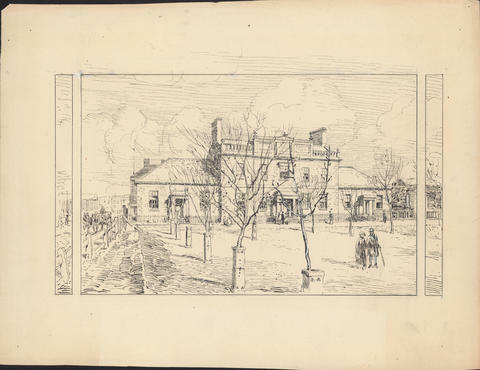 Item is a drawing by Arthur Lismer based on an earlier illustration of Dalhousie College; the figures in the foreground are believed to depict his wife, Esther, and his friend and fellow painter, A.Y. Jackson. The image was commissioned for One hundred years of Dalhousie, 1818-1918 (1920), and was reproduced in D.C. Harvey, An introduction to the history of Dalhousie University (1938) and G. Kelley, Arthur Lismer, Nova Scotia, 1916–1919 (1982).